In marketing, content is king because it attracts people to your brand. In online fundraising, context is king because it drives people to support your cause. Peer-to-peer fundraising, in particular, relies on effectively communicating said context. To become powerhouse supporters of your cause, fundraisers rely heavily on the context of a campaign because it’s how they relate their personal story to your larger mission. Why: We noticed that top campaigns on Classy’s new Fundraising Suite emphasize imagery and branding. First and foremost, add a transparent, high-quality logo to the header so supporters instantly recognize this page as a piece of your story. Then add a main image that’s striking and high-quality. If you don’t have a photographer or graphic designer handy, make use of Classy’s built-in image library to find high-quality, royalty free photos. Why: Consider the action you want supporters to take and what you want them to be a part of when they become a fundraiser. Identify what language motivates your supporters to act, and actively conduct tests for effectiveness. For example, a year-round peer-to-peer fundraising program might have a different call to action then an urgent time-based campaign. Why: Building in levels for your peer-to-peer fundraising campaign helps site visitors choose what fundraising goal is right for them. They can also help motivate someone to start a team, increase their fundraising goal, and amplify their impact. Why: Encourage friendly competition to motivate peer-to-peer fundraising teams to raise as much money as possible. Real-time insights to top performers lets fundraisers know how they stack up next to fellow supporters. Why: Social proof not only encourages participation, but it also publicizes your communication and appreciation for donors. Plus, thanking donors is an easy way to make start donor stewardship off on the right foot! 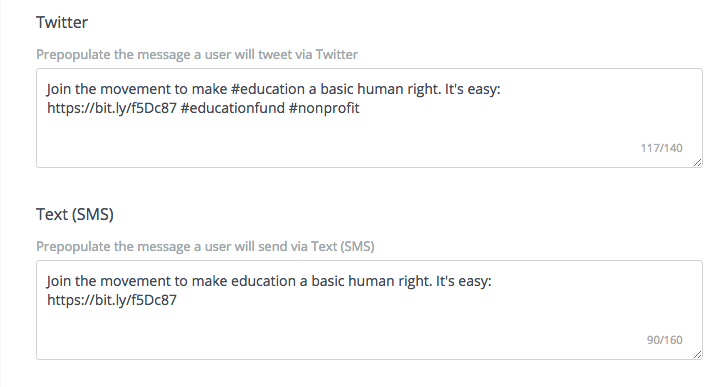 Why: You can set supporters up for strong appeals with preset social share copy. These recommendations will appear whenever someone shares your campaign page. Don’t forget about your peer-to-peer fundraising campaign all-stars: teams and individuals who raise money on your behalf! Here are a few simple ways to set them up for success. Why: Make your teams and fundraisers feel special! You don’t have to have a design team to create these unique graphics either: Try a tool like Canva—as I used above for the “Official Fundraiser” sticker—to add graphics that delight teams and fundraisers. Setting a default appeal and story for an individual fundraiser. They can always personalize this after they sign up! Why: Teams and individuals fundraise on your behalf, so you want to ensure they properly represent your brand. Set a default story that presents your cause, mission, and impact. When you remove the burden of explaining your work, your fundraisers can get their pages up and running even faster. Why: When you know who your fundraisers are, you can better tailor your communications and inform your engagement strategy. In the example above, fundraisers are asked how they heard about the organizations. Aggregating this data helps to determine additional marketing opportunities. 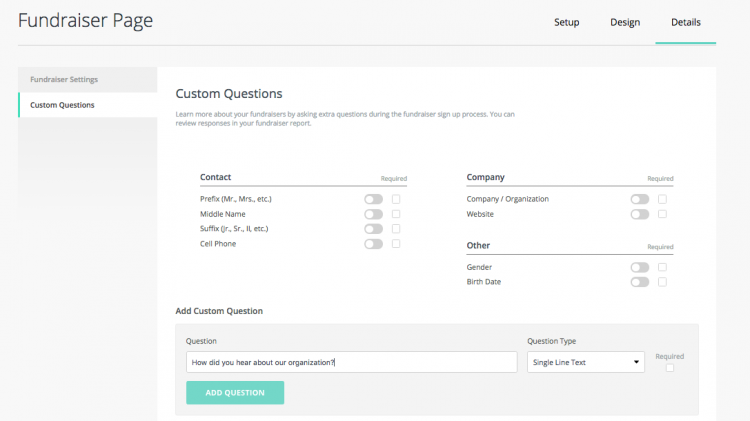 In another example, you might ask “Is this your first time fundraising for a nonprofit?” Their answer will help you determine what resources they’ll need from your organization. These tips are applicable to any peer-to-peer campaign you run, whether on Classy or not. The screenshots shown here are part of Classy’s new Fundraising Suite, a completely revamped campaign building experience that spotlights your cause. To learn more about the upgraded peer-to-peer campaigns on Classy, read about our current private beta process or get in touch to request a demo. Ready to Activate and Empower Fundraisers?